It is no longer fashionable, but I truly don't care. I'm not doing it for those people who think fashion is the end all of existence, I never do anything for that. I was that guy. I skated 21,000 miles. I would do 100 miles in a week. My peak week was one week that I took off from work and skated 204 miles in seven days total. I was at Fairmount Park in Philadelphia so much on those skates that the park workers asked me if I was training for something. Nope. I really do enjoy skating. In fact, I skated so much that I had to actually limit myself to 100 miles a week normally because I could over-train. Near the end of the season, October into November, before the time change I would slow my skating down. I had to distance limit myself to get the metabolism back down to something approaching normal. Eating a training diet in the winter was never a good thing. Even now when my fitness level is not at that same peak as it was. Meh. Don't care. I've got my box of parts and tools and know how to use them. In season, I used to slack. I would tune the skates up every other week. That's 200 miles. They really needed it weekly but it takes an hour just to tear them down, wipe off the dirt from the bearings, reassemble everything with loctite and call it good. That was what I did over the weekend. One of my Weekend Projects. I've been skating these days just enough to go out and enjoy it. Headphones on playing music to keep me moving, I'd hit the park where the Goodyear blimp lands and do a circuit plus a mile. Only 5.5 miles? Yep. I'm not skating to prove anything. Just to enjoy a visit with an old friend. I was all set to do a complete teardown - that was the 200 mile service. Pull all the bearings from the wheel, the speed kit from the axles, and fully disassemble the bearings. That meant I'd be de-greasing, drying, re-greasing, and reassembling each of the 16 bearings, then the wheels, and finally inspecting the boots. Did all of that with a smile on my face. I will let you in on a secret though. Duct tape. I duct taped the inside of the boots. No, seriously. It's like when you wear shoes out. That spot in the back of the heel where the fabric wears out first. It starts as a small hole or tear. Put a small square of duct tape over that and you'll be fine. Just don't tell anyone. Why do I do that? My racing skates cost $600 per set. Even this pair of "run of the mill" boots were over $250 back in the day, although I got my competition discount from the shop I went to. I used to get some bearings tossed at me by the same shop, long since closed in the collapse of the sport. You just can't run out to a sporting goods store these days and pick up a serviceable pair of high end touring skates any more. For that matter I don't think they're even being made available. Philadelphia was a bit of a hotbed for distance and speed skating. I was into distance. I'm way too tall and muscular to truly be fast. So I'd do 30 miles at 12 MPH average. 4 minute miles. I could do that forever if the winds were at my side. Even faster if it were at my back. Then it would be scary-fast. I'd do the run from Philadelphia to Valley Forge if the Fairmount Park loop was clogged with some sort of "Walk" which was just a disruption more than anything else. It also helped that I managed to get out there some days before 6AM, park at Falls Bridge, Skate to the Art Museum for a warmup before anyone else was out there. Then do 4 mile sprints from the Rocky Steps to Falls Bridge and back until I got tired, bored, or the Walk was starting. Easier to go to the Valley Forge loop, Schuylkill River Trail. If I needed more distance, it was about 15 miles from Philadelphia parking through Valley Forge, and to the head of the Perkiomen Trail at Oaks, PA. There's a bridge over the Perkiomen Creek that I used to sit, drink my water, eat my power bars, and chat with the other skaters. One of my favorite spots in the world to sit and chill out. Pretty country out there, West of Norristown. Actually, even though it ran through some industrial areas, it was generally quite pretty as long as you weren't in Norristown, PA. That was a pretty ugly town itself. But the skating was fun. Bring a quart or two of ice water, 600 calories of snacks to keep from hitting The Wall, and tank up at the water fountains at Valley Forge Park. Plenty of Regulars, and Friends. Yes, up to 600 calories. Peak season, I needed 3000 a day on my enforced no-training day, and up to 6000 a day just to get my 30 miles plus weightlifting in. That scene is long gone. Pompano Beach Air Park has its own Regulars. A bunch of leftover Canadian Snowbirds, primarily from Quebec. A very few on skates, most on bikes. Some locals getting out there to enjoy the trail. It's black ice. Smooth asphalt. 4.5 mile loop. You can see the little planes landing at the civil aviation airport. Sometimes the Goodyear Blimp is out, and if it is landing I swear it comes in at a sharp angle up to 45 degrees. Never expected to see that when I got there. It's not my favorite trail, but it works. And trust me, after 21,000 miles, I've seen many of them. The servicing worked. 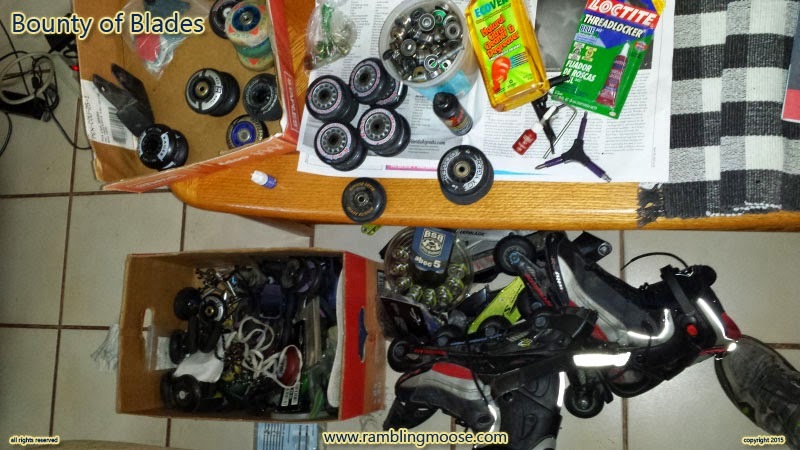 I have a lot of wheels I picked up after skate shops closed up at a dollar or less a piece, some others from skates people threw out that were used once or twice, and I even bought a pair for "backup" at the thrift shop. The box is a full "Paper box" that would work for shipping reams of paper. Along with the probably more than 200 bearings in the bucket, all the assorted axles and screws, bolts and speed kits, I'm set. Good for a couple thousand miles without ever visiting a skate shop. All of this for a non-fashionable sport that I truly love.